DETROIT – Happy days are here again for Porsche, Lamborghini and other elite auto brands. Porsche AG has better-than-expected orders for the revamped 911 sports car and its biggest backlog ever. Buyers of the Lamborghini Aventador supercar may have to wait more than a year for delivery, while demand from China fueled record deliveries in 2011 for the 107-year-old Rolls-Royce brand, beating a mark set more than three decades ago. Sales of high-end cars, including BMW AG's namesake brand and Daimler AG's Mercedes-Benz, may in 2012 surpass the record set before the financial crisis damped demand, according to IHS Automotive. The market researcher forecasts sales for the segment in 2012 of 7.02 million cars, up 13 percent from last year's 6.23 million and beating the previous record of 6.27 million set in 2007. Audi AG, Daimler and BMW this week all forecast overall market growth, including the volume brands, of about 4 percent in 2012. BMW, which also makes Mini and Rolls-Royce brand vehicles, expects to outpace the market on demand for new versions of the 3-series sedan and the 1-series compact. "We do see growth next year for the overall car market and an accelerated growth for premium cars," Ian Robertson, BMW's sales chief, said this week at the Detroit auto show. "There's no doubt that the confidence of the customers in the premium segment has grown quite quickly." The makers of very expensive cars are pushing beyond their traditional markets in the U.S. and Europe to emerging economies, where a new class of wealthy is looking to flaunt their success, said Dave Sargent, vice president of automotive research at J.D. Power & Associates in Troy, Michigan. "The future looks pretty rosy for these companies," Sargent said. "Now you got places like Russia and China where there's a lot of people with a lot of money all of a sudden. It's like having lots of lottery winners all at the same time. When people come into a lot of money, one of the first things a lot of them will do is buy a super car." Backed by an 18-month order backlog for the Aventador and a six-month wait for the Gallardo, Lamborghini expects to beat last year's deliveries of 1,600 cars in 2012, even with demand in Italy weak because of the debt crisis, Stephan Winkelmann, head of Volkswagen AG's Lamborghini brand, said in an interview in Detroit this week. "We are conservative with our expectations," said Winkelmann. "Our purpose is not to deliver big numbers, but to deliver dreams for a very select group of people." Production of the Aventador is now at full capacity, with 900 cars due to be assembled at the Italian company's factory in Sant'Agata Bolognese, Winkelmann said. In addition to the Aventador, Lamborghini will start building the 1.6 million-euro Sesto Elemento supercar, he said. "Customers have become tired of pushing back purchases year after year and are returning to old buying habits," Wolfgang Duerheimer, CEO of Volkswagen's Bentley, said last week. "If the economy doesn't let us down, there's a good chance that we can approach the 2007 record" in deliveries this year. The Crewe, England-based brand is targeting a "robust" double-digit percentage growth in deliveries. Bentley plans to take advantage of the stronger demand by adding 25 dealers this year to its current 161 sales outlets worldwide. Expansion will focus on China, Russia and mainland Europe. Sales growth is expected to be fueled by deliveries of the new ultraluxury Continental GTC convertible. V-8 engines for the entire Continental line will also boost demand, Duerheimer said. The carmaker plans to expand its lineup and expects to decide in the first quarter on adding an SUV, which would be priced at more than $140,000 (110,000 euros), Duerheimer said. The company is also considering an extended-wheelbase version of the Mulsanne and more variants of the Continental, he said. Rolls-Royce said this week that growth in all regions drove deliveries 31 percent higher to 3,538 cars last year, beating the previous record set in 1978 by 191 vehicles. China became Rolls-Royce's biggest market in 2011, three years ahead of a target the company set in February. "Overall, I am optimistic that we will see the next record year for Rolls-Royce Motor Cars in 2012," CEO Torsten Mueller-Oetvoes told Bloomberg Television in a Jan. 9 interview. Maserati plans to boost deliveries by more than fivefold to about 35,000 in 2014 as it adds models and dealerships worldwide, especially in emerging countries. The Italian carmaker owned by Fiat S.p.A. will build its first SUV from next year in Detroit. It wants to sell at least 20,000 SUVs a year, with the major market being U.S. and China, CEO Harald Wester said yesterday. "We have an aggressive plan for the future," he said. "My dream is to get to 55,000 units sold a year" when all the new models come to the market. "It has never been done before in the luxury sector, it can be done." China became Maserati's second-biggest market after North America in 2011 as sales almost doubled to 780 cars. The Italian carmaker expects "flat" sales worldwide this year before introducing new models from next year, Wester said. Sales rose 10 percent in 2011. German luxury-car manufacturers' sales last year were propelled by demand in China, where they all posted sales gains of at least 30 percent, led by a 65 percent jump for Porsche. Audi CEO Rupert Stadler estimated this week that China's car market will expand about 8 percent in 2012. 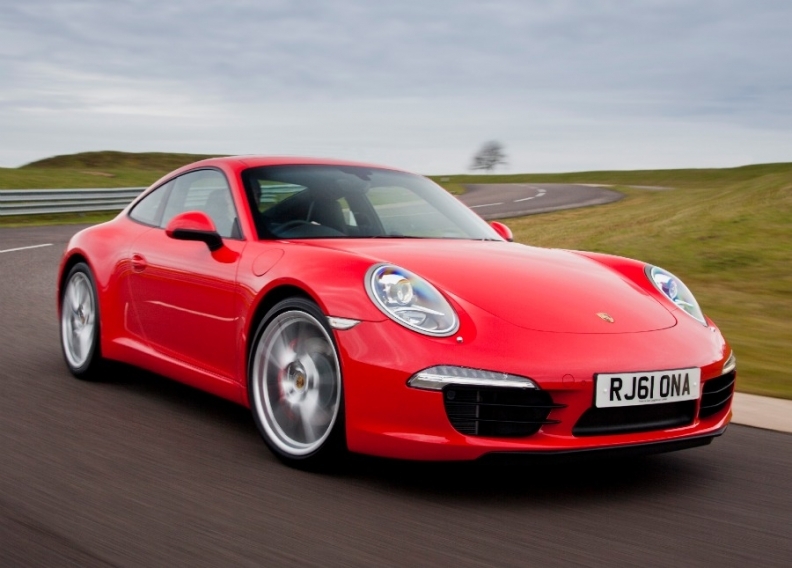 The new 911 has orders above Porsche's expectations, said Matthias Mueller, the brand's chief. The company will also introduce a revamped Boxster roadster in the second quarter. Porsche targets beating last year's sales record of 118,900 in 2012, Mueller said. Still, he advises caution. "Last time, everybody thought that the luxury segment would escape the crisis, but in the end we were hit just as hard," Mueller said in an interview. "If the economy declines, we won't escape it."